Michael Ferris Gibson, the Director/Producer of 24 hours on craigslist lives and works in his hometown of San Francisco. After leaving USC film school and graduating from Wesleyan University in 1994, Michael returned to the Bay Area and immediately immersed himself in the local film and theater communities. 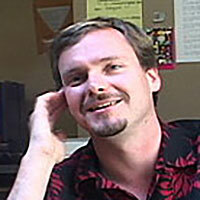 He founded Yerba Buena Productions in 1995 to produce the experimental short film Sacrament. In 1996, he began the monumental task of writing, producing and directing his first narrative feature, the sci-fi film noir "Numb which he finally finished in 2004. Michael has also been involved with local live performance (most notably with the Cutting Ball Theater Company) as well as helping to produce the documentaries Confessions of a Burning Man and the multi-award winning Straight Outta Hunters Point.